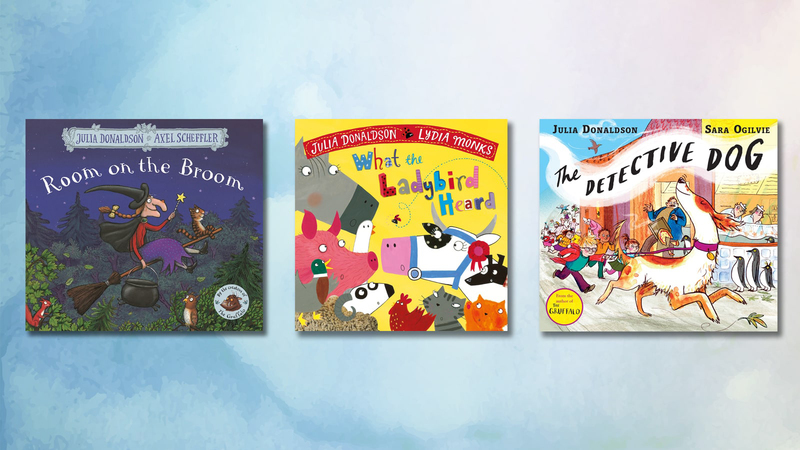 You’ve journeyed into the deep dark wood with the Gruffalo and jumped on the broom with the witch, her cat and her very tall hat, but have you read these other brilliant books by Julia Donaldson and her amazing illustrators? This year marks twenty years since Julia Donaldson and Axel Scheffler’s bestselling picture book, The Gruffalo, was first published by Macmillan Children’s Books in the UK. If your little one is a fan of the creature with terrible tusks and terrible claws and you're looking for more books by Julia Donaldson and her illustrator partners, read on for our guide to her other bestselling stories. If you’ve already read The Gruffalo and met his daughter in The Gruffalo’s Child, why not read one of these picture books by Julia Donaldson and Axel Scheffler next? A classic tale of friendship with one very scruffy, but very kind and much loved giant. George doesn’t want to be the scruffiest giant in town, so when he sees a giant-sized clothes shop he decides it’s time for a smart new look. His new clothes make him the smartest giant in town, until some new friends need his help . . . This story of a witch and her cat, and the medley of creatures that hitch a ride on her broom isn’t just for Halloween! The witch loses her hat, bow and wand which are returned by a dog, a bird and a frog, all eager for a ride on her broom. It’s the more the merrier until the broom snaps under its heavy load -m and there’s a greedy dragon looking for a snack . . .
Go on an adventure with this tiny snail and the great big grey-blue humpback whale. A little snail hitches a ride on the tail of a whale and feels so small in the vast world he sees. But when disaster strikes, it’s the tiny snail who saves the day. Julia Donaldson and Axel Scheffler’s most recent creation, Zog is a studious but very accident prone dragon who forges an unlikely friendship with a mysterious princess. Lydia Monks’ bright, bold illustrations and Julia Donaldson’s trademark rhymes combine in the What the Ladybird Heard picture book series. Following the story of a crime-fighting ladybird and her animal friends, these books would make an excellent gift for children who love The Gruffalo and Room on the Broom. View all the books in the What the Ladybird Heard series here. When Josephine leaves the shop after buying some new running shoes, she realises she’s being followed by a bear with a backpack. Luckily for Josephine, her new shoes are anything but ordinary – these are magic shoes! This magical (and glittery) adventure by Julia Donaldson and Lydia Monks is a story you'll read together again and again. Ideal for children aged 5–7 who are starting to read more independently, this chapter book series by Julia Donaldson and Lydia Monks follows the adventures of the magically mischievous Princess Mirror-Belle. The Princess Mirror-Belle books are also available as audiobooks, narrated by Sophie Thompson. Younger readers can also enjoy the picture book, Princess Mirror-Belle and the Dragon Pox. View all the books in the Princess Mirror-Belle series here. Sugarlump the rocking horse longs to explore the outside world, and his wish is granted with the arrival of a magical unicorn who turns him into a real horse. But, after trotting round the farm, galloping at the racetrack and dancing at the circus, Sugarlump learns that you should be careful what you wish for. Luckily the unicorn is there to grant him one last wish . . .
Seeking fame and fortune, the Singing Mermaid joins the circus. But though the crowds love her, the wicked circus owner keeps her captive in a tank, and soon she longs for the freedom of her ocean home. This delightful rhyming story is full of colourful, glittery illustrations on every page. Join detective dog Nell as she solves the mystery of the missing books in this bestselling story by Julia Donaldson, illustrated by Sara Ogilvie. With bright, vibrant illustrations and lots of rhymes you can read together, The Detective Dog is guaranteed to become a firm favourite for children of all ages. A gorgeous picture book by Julia Donaldson and award-winning illustrator Catherine Rayner, The Go-Away Bird is a tale of friendship and working together, written in Julia’s trademark rhyming verse. A laugh-out-loud picture book from Julia Donaldson, illustrated by David Roberts, The Cook and the King is the story of a hungry, but very fussy king and his search for the perfect cook. This deliciously funny cooking adventure is sure to become a firm favourite with children and adults alike. All Julia and David’s books have been reissued with beautiful new covers in 2019. For something a little different, why not grab your wellies and head outside with The Gruffalo Spring and Summer Nature Trail. Packed with fun spring and summer themed activities, nature trails and over 400 stickers, this book is a fantastic resource to get the whole family outside and exploring the great outdoors. Say hello to the many wonderful Julia Donaldson characters in The Gruffalo and Other Stories newsletter.